Human rights donors are keen to wean domestic civil society off their chronic foreign aid dependence, and so are local rights organizations. Relying on outsiders for money is problematic because it undermines local participation and accountability, and may hurt NGOs’ legitimacy. International donors, moreover, are a notoriously fickle bunch, often moving from one topic to another with the ebb and flow of organizational politics. To learn whether ordinary people will donate to local rights groups, we surveyed a representative sample of Mexico City adults. We discovered that many people are in fact willing, if asked in the right way, to make small donations. Cumulatively, these small donations could add up to serious money. We began our investigation by interviewing representatives of all legally registered, Mexico City-based, rights groups. Our research partners in FLACSO-Mexico, a local university, identified 40 such groups and interviewed 34 (85%). Local NGOs told us it was hard to raise funds from Mexicans because citizens were unwilling or unable to donate. Most NGO representatives said they would love to raise money from individual Mexicans to diversify revenue sources, build local constituencies, and reduce foreign dependence. But local NGOs told us it was hard to raise funds from Mexicans because citizens were unwilling or unable to donate. Only 30% had ever tried to do so, however, and only 14% were successful. To investigate, we interviewed a representative sample of 960 adults, in research supported by the Open Society Foundations, which donate money to rights groups worldwide. The foundations remain committed to supporting these groups, but are keen to learn if domestic civil society can raise more funds locally. Our survey included many different questions, but some of the most exciting results came from the “real money” experiment, in which our 20-plus survey enumerators gave each respondent a small bag with $50 pesos, in five-peso coins. Given that the daily minimum wage was roughly $73 pesos in 2016, this sum is not inconsequential. 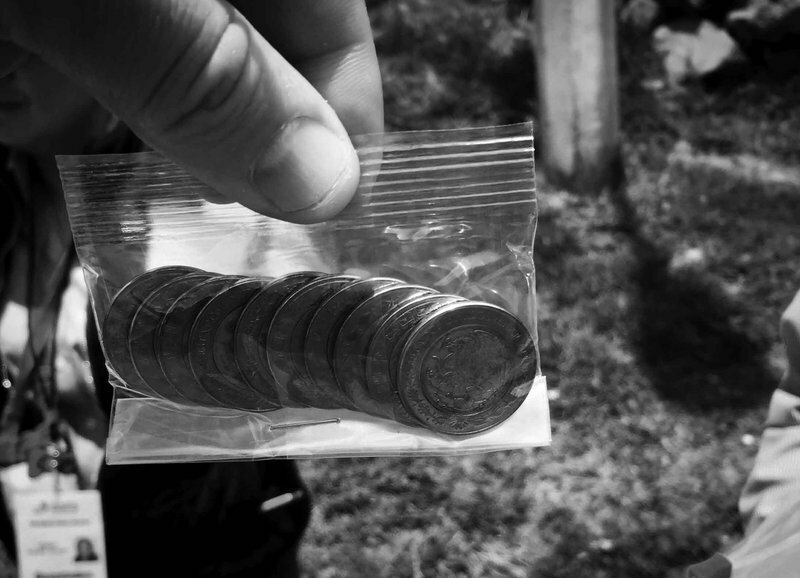 Some exciting results came from the “real money” experiment, in which 20-plus survey enumerators gave each respondent a small bag with $50 pesos, in five-peso coins. Given that the daily minimum wage was roughly $73 pesos in 2016, this sum is not inconsequential. We told respondents the money was theirs to keep, but if they wanted, they could donate some, or all, to a “Mexican human rights organization,” which we then proceeded to describe. To see which type of organization the public was more likely to support, we randomly allocated 240 respondents into each of four groups, each of which received a different description of a hypothetical rights organization. For the first group of respondents, we described a “Mexican human rights organization” that was independently audited and had received international awards for financial transparency. For the second group, we described a human rights organization that was highly effective at bringing rights abusers to justice and getting them behind bars. For the third group, we described a sympathetic rights abuse victim (a labor organizer, husband, and father, identified by name, disappeared by masked intruders) and said the organization was trying to help him and his family. This description probed the power of narrative to evoke empathy—and increase donations. For the fourth group, we described a generic human rights organization with no specific attributes. This was the control group, a baseline against which we compared the other three groups. The results of the experiment were promising. The average donation, controlling for other factors, was $21.6 pesos, or 43% of the $50 pesos we gave each respondent. Overall, almost 80% of respondents donated at least something to the fictional “Mexican human rights organization”; 22% donated the entire sum. These findings alone, we believe, suggest there is real potential for Mexican rights groups seeking to raise local money. The “transparency” story had the strongest effect on donations, since respondents in that first group gave four pesos more, on average, than the baseline sum. Transparency is important because of Mexicans’ widespread concern that their money will be stolen, skimmed, or wasted. When assured otherwise, they are more eager to give. The “effectiveness” story increased donations by $2.6 pesos. Potential donors want to know that their money will actually accomplish change, in addition to being spent as organizations claim it is spent. In contrast, the narrative emphasizing direct help to victims did not increase donations. It may be that the recent, dramatic increase in violence has numbed some Mexicans to rights abuses. Since most Mexico City human rights organizations use “testimonials” when describing their work to the public, they may wish to reconsider their messaging strategies. Importantly, even the poorest respondents donated some money. To measure individual respondents’ wealth, we created an assets index, asking respondents how many consumer durables their household contained, such as number of light bulbs, computers, cars, telephones, and more. People located in the top fifth of this index donated roughly $32 pesos, but people located in the bottom fifth—Mexico City’s poorest residents—averaged donations of $22 pesos, a considerable sum given their overall economic conditions. Other factors also boosted donations. Not surprisingly, the more people thought human rights conditions in Mexico were problematic, the more they donated. Since 63% of the sample said there was either “no” (17%) or “very little” (46%) respect for human rights in Mexico today, the demand for human rights solutions is genuinely high. This should boost giving. Education was also correlated with donations, as university-educated respondents donated nine pesos more, on average, than those without an education. Political knowledge, measured with questions about national, regional, and international issues, also mattered; politically knowledgeable people donated five pesos more. And while only a small number of respondents said they had ever donated to a human rights organization, these “prior donors” were four times more likely to donate in the experiment. Thus, if Mexican rights groups can get a member of the public to donate once, they will dramatically increase the chances of that person donating again. There is no way around the fact that raising money from individual donors costs money: human rights NGOs will have to hire new staff, create new messages, build new databases and accounting systems, and much more. Yet, international donors can help wean local groups off foreign dependence by investing in their capacity to raise money locally. Modest investments of this type could transform the global human rights community into a truly self-sustaining, autonomous force. **The research described in this article was conducted with assistance from Kassira Absar, Juan Pablo Bolaños, Jairo Lopez, and Gerardo Maldonado.